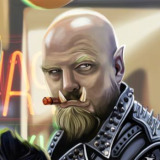 3 Shadowrunners looking for a gm, the time we would be able to play would be Saturdays or Sundays around 1pm, due to work restraints we could have to change the time between Saturday or Sunday but the gm would be notified a week in advance. The gm or any players the gm wants could also bring character(s). we are new players who for the most part have read all avalable suppliments front to back, and would love to play this great game . we are looking to play online, roll20 or any other source would be fine, discord for communication preferred. Fair enough then. They are pretty active on FB...if you message them they might be able to hook you up with a GM.